Have your favorite Rastrelli's pizza shipped right to your door! Rastrelli's has a special everyone is sure to love! The Baldacci Room specializes in imported beers, the finest wines, and top shelf mixed drinks. Join us Monday thru Friday, 4:00 to 7 p.m. for Happy Hour and enjoy free hors d’eouvres. When you are looking for the pinnacle of elegance and professionalism, look no further than the Tuscany Special Events Center at Rastrelli’s. When you are looking for the pinnacle of elegance and professionalism, look no further than the Tuscany Special Events Center at Rastrelli’s. From casual business meetings to elegant wedding receptions and dinners, the Tuscany can accommodate any group up to 350 guests. 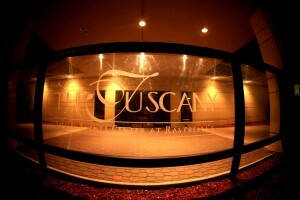 With its artistic, yet classical décor, the Tuscany is a perfect compliment to your event. The room itself is elegant enough to stand alone, yet simple enough to enhance your own decorating ideas. The room comes complete with a stage, dance floor, bar and private bridal room. Our staff is happy to work with you to create your own personal menu, or help you choose from many of our popular preset menus. We want to make your event not only memorable, but successful as well. At the Tuscany, we are also fully equipped to handle your business needs with microphone, a podium, screens, wireless internet and wireless audio capabilities. With Rastrelli’s long standing tradition of great service and great food at a great price since 1939, you can be assured that your guests will have fond memories of any event at The Tuscany Special Events Center. Your Happiness is Our Priority!